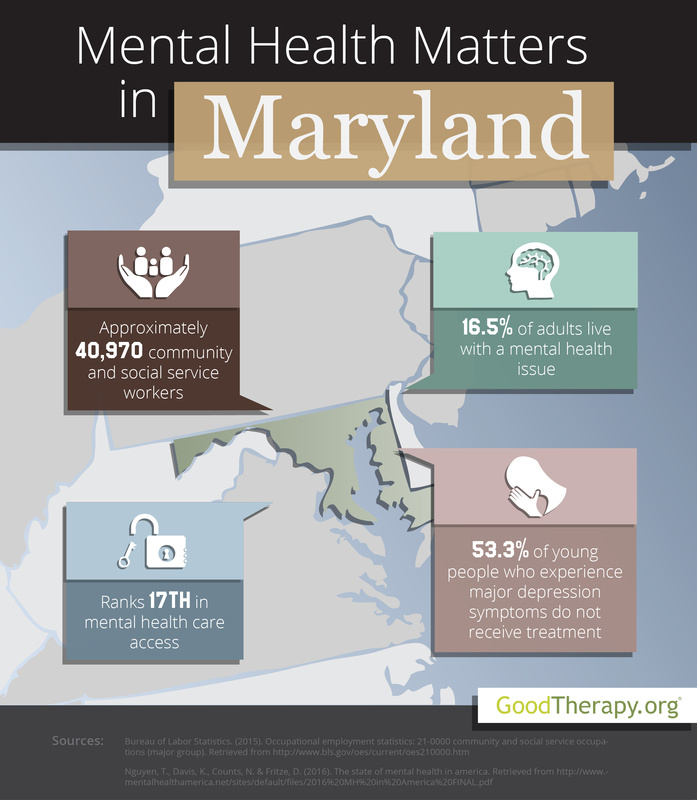 Find a therapist in Maryland with GoodTherapy.org. Maryland was home to just more than 6 million people in 2015, according to figures from the United States Census Bureau. Approximately 60% of residents were white, 30% were black, 6.4% were Asian, and 0.6% were American Indian or Alaskan Native. Females comprised 51.5% of the population. Of the total number of residents, the Bureau of Labor Statistics states 40,970 individuals worked as depression therapists, child psychologists, psychiatrists, clinical social workers, parole officers, guidance counselors, health educators, religious workers, counselors working at rehab facilities, or marriage and family therapists. In 2016, compared to other states and the District of Columbia, the state of Maryland received an overall rank of 13th for mental health standards and practices from Mental Health America (MHA). Maryland was given 6th in adult ranking, 21st in youth ranking, 13th in prevalence of mental health issues, and 17th in access to mental health care. All of these rankings are in the upper half of the list, indicating a relatively low rate of mental health conditions combined with a relatively high rate of access to care or treatment. At 16.5%, a low percentage of adult residents experience mental health issues. Maryland was 3rd in this mental health category. Researchers from Mental Health America believe this ranking correlates with the low rates of poverty in the state. Maryland was also ranked 14th for adults with dependence on drugs or alcohol, and 3rd for adults with serious thoughts of suicide. Even with these statistics, it appears some affected adults may be unable or unwilling to find a therapist who is able to render needed care. Maryland was 37th for adults with mental health issues who did not receive treatment. Approximately 14.9% of adults with these mental health concerns are uninsured. While the state was ranked 13th for adolescents with an addiction to drugs and alcohol, therapists in Maryland contend that clinical depression may be a concern among the younger population. In the categories of young people who have had at least one past year major depressive episode, and young people with severe episodes of major depression, Maryland was ranked 38th and 47th respectively. MHA researchers have highlighted correlations between the percentage of young people with major symptoms of depression and the high rates of violent crime in the state. Nevertheless, the data suggests options for effective depression treatment are in place. Maryland had the ninth-lowest percentage of young people with symptoms of major depression who did not receive mental health care.